UPDATE: Many has identified this flower to be of a Desert Rose. Thanks to all for the tip. As some may have guessed, I'm not really a flower person, but this flower caught my attention with it's very beautiful bloom. WOW!! This is gorgeous!! A phenomenal splash of color to say the least! This is Gerogia O'keefe-ie to me. It was perfect for the challenge and a strong beatuiful peice of art on it's own. Bravo, sir. Unknow origin??? I do believe it came from a seed. This is one of very few flower shots I actually like. It's awesome. I've actually tried to mimic the look you've achieved here and have failed. I'm impressed with this. This is amazing!! Beautiful color and presentation! Congratulations! Great Picture I absolutly love it! Wow, what can I say? Great capture! Would have scored high with me. Very vibrant and very well exposed. Works well. To be a bit nit-picky I'd like to see the flower just a tad more to the right, but hey, the composition definitel worked for ya. Subject is very strong... nothing can be improved here. ALL GOOD! And VERY NICE LIGHTING! LOL, can't exactly tell ya how to grow the vote much past a blue ribbon. Just keep up the stunning work. Keep up this kind of work and you'll be seeing more ribbons in your future! 'gratz shin on a very well done picture..
How did you manage this? what post prod did you do? is it possible you could say what you did to edit it? i like it alot alot! wow, this photo is truely breathtaking... i love it!! well deserved ribbon!! congrats.. Very nice work here! Congrats on the blue! funny that a guy named crayon wins "burst of color". great shot, really, really nice. Wow. Really fantastic is more like it. Congratulations!! Well deserved ribbon!! You must be proud to win the first ribbon for your camera!! Message edited by author 2006-01-18 00:38:32. It's stunning, well done. Congrats on the blue. I insist, no more flowers. Congrats Crayon! A ribbon on your 4th entry! I am jealous. Wonderful image that deserves much accolade and praise. Good job! This is exquisite. Congratulations on the well-deserved blue! It really jumps out at you, well done, keep it up! Message edited by author 2006-01-16 03:00:37. Congrats on your blue with this tender flower composition. I think this is one of the all time best flower shots on DPC. Beautiful lighting and color. Congratulations on a deserving first place. 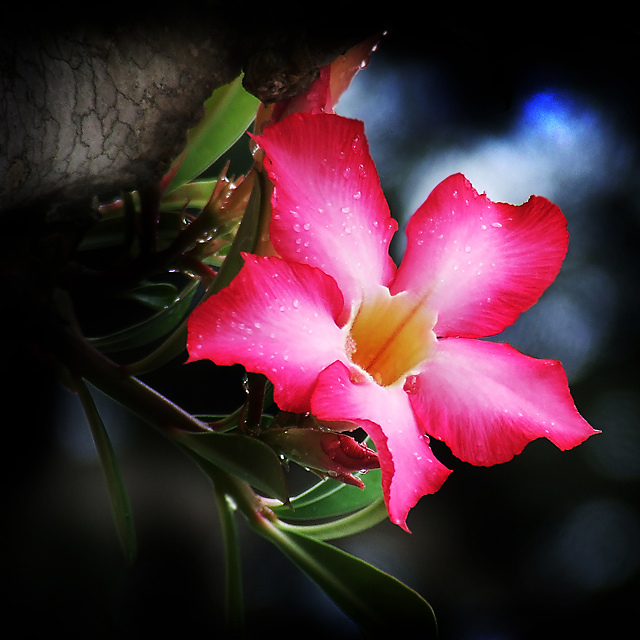 The flower is of "Adenium". Commonly known as "Desert Rose". I'm now desperately waiting for my adenium to flower (Thanks to your picture!). To know more about the species go to //www.tropicanursery.com/adenium/story.htm. Anyway, dont let the water stay on the flower... its a killer for 'desert rose'. congrats crayon! finally a blue n a well deserving one too! hope to see more of such marvelous shots! really love e colors in the composition n e dew drops on e flower, adds so much life into the picture. well done! Congrats on your first blue! Just a perfect entry for this challenge. Many congratulations - this is really beautiful! Excellent work. Awesome... The freshness is contagious! Wow Wow Wow.. I think this is the best photograph I've seen on DPC, ever. A wonderful image... I knew it would do well. Congradulations on your first ribon and a 7.0+. Well deserved. I believe that the flower is that of 'Desert Rose', botanical name: Adenium obesum (I grow it in my nursery). Whatever the type of flower, this picture is beautiful! Wowsers! Great pic! Big congrats on your first blue! Great job I am sure Art is weeping with pride. Congratulations on your BLUE, Shin! I am very happy for you. This is one of a kind image and what a lovely addition to the DPC archives. Possibly the most electrying color burst in this challenge. Wow! Good job nailing this one! Great picture! Yup you nailed that one right from the get go! Congrats! One of the best I've seen on DPC! Congratulations on the blue! certainly a most striking image. A nice soft feel to this flower... the water droplets are a nice addition too. I like the hint of blue in the background. great use of light and colour with no distracting elements to distract the eye. Please, Please, PLEASE, share your post processing technique with us! This is an absolutely beautiful shot. I love the darkness where the color isn't... that incredible pink just draws you in to the photo. Ahh, I can't say enough good words about this shot, so I will let my score say it. 10! I think this is probably the best BURST of COLOR in the challenge. Good Luck. The dark vignetting definatly makes your color a �splash of color.� Very sharp and crisp... very nice. Very nice, Love the beautiful pink colors agains the dark background. Really stands out. Good composition and focus. Just what the chalenge asked for, "A Burst of Color". This is just a triffic shot, and one of my favorites..... I love it. I usually breeze through flower pics but this one is so exceptional. A true artist you are. There are a lot of flower shots time time around. Yours distinguishes itself with overall excellent composition and great DOF. The vignetting is very tastefully done! Bumping up. The vloer is beautiful and the color is rich. Definatly one of the best of the challenge. Very lovely. This is beautiful and I like the title as well. It has a slight softness, but it adds to the velvet like feeling you'd have if you touched it. Absolutely beautiful. Nice bokeh. Top 10 for sure. Proudly hosted by Sargasso Networks. Current Server Time: 04/18/2019 09:08:27 AM EDT.